COURCHEVEL IS WITHOUT question one of the most glamorous ski resorts in the French Alps. A-listers and aristocracy have been arriving by private plane or helicopter at the resort’s tiny on-slope airport since Brigitte Bardot helped to put it on the map in the 1960s. This is celebrity central where even in mid-winter a shop advertising custom built yachts is doing a brisk trade and on-snow polo is a must. Icicles dangle like diamond earrings from the balconies of the chalets as we stroll to the centre of town and the designer boutiques along the way are equally glittering: Hermes, Fendi, Louis Vuitton, Prada and Chanel to name but a few. The stars aren’t just skiing on the slopes. Courchevel offers 8 Michelin-starred restaurants (with 14 stars between them) which means there are more Michelin stars per square metre here than anywhere else in the world. While out of 24 palace rated hotels in France - three of them (Hôtel Les Airelles, Cheval Blanc Courchevel and Hôtel Le K2) are located in Courchevel. And some of the other hotels are pretty five-star too. Aman Le Mélézin, the only Aman Resorts’ hotel in Europe, has just made-over its spa and wellness area. We sample the hotel’s Nama restaurant and decide it is one of the best Japanese restaurants we have ever eaten in and certainly the best sushi-on-snow. Another favourite haunt is the boutique luxury hotel Le Saint Roch. This chic hotel peacock art with flowing tales in the lounge and a sensual spa and a surreal swimming pool with its bubbles of glass on the ceiling. Many of the most famous, however, choose privacy and stay in one of the myriad of luxury chalets that dot the slopes. We are staying at Chalet Chamois in Courchevel 1650, complete with private boot room, sauna, outdoor Jacuzzi , chauffeur, housekeeper and a chef on demand (although we choose to cook for ourselves). It is a stunningly beautiful chalet with balconies and floor-to-ceiling windows that overlook the slopes. We are blessed with perfect weather, every morning we look out onto clear blue skies and shimmering snow.. The Courchevel Valley is made up of five villages, on a clear day there are stunning views of Mont Blanc. For beginners, there's a huge range of slope and it’s a piste-skiers dream, with long red runs such as Creux and Chapelets. Off-piste highlights such as the Les Avals valley with over 1,000m of powder, the Saulire couloirs and the Roc Merlet face will test the most advanced skiers. There is one day when snow falls with fairy-tale fluffiness dusting the whole of Courchevel in a layer of castor-sugar snow, with ice-cream scoops of white on the pine trees. On a snowy day, the lower slopes are tucked in amongst the trees, and we enjoy a magic afternoon skiing through the forest la Tania. 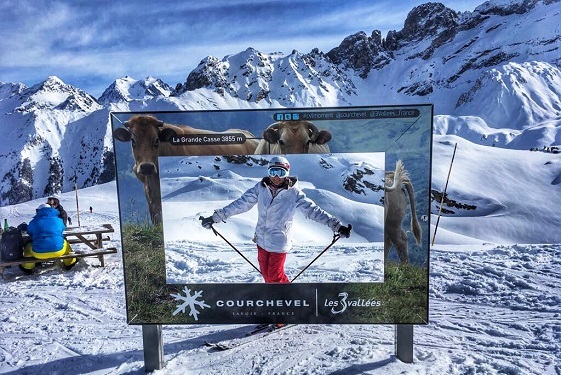 Courchevel is part of Les Trois Vallées piste network – a mega ski-zone that includes Meribel and Val Thorens so the skiing is extraordinary As a whole, Les Trois Vallées can claim to be the biggest ski area in the world, Courchevel alone encompasses1,300 acres of mountain. New for the 2018/19 season is the modernised Gragettes gondola between Courchevel Village 1550 and 1850. The new 10 seater gondola will have a capacity of transporting 2400 people an hour. Construction of a new base station costing at Courchevel La Praz (1300) has also begun. The 27 million euros project will open in December 2019. Also this year is the tenth anniversary of Art on the Summit a magnificent venture which places artwork in mountain abckdrops. This year the work of Dali will feature, as it did for the first ever Art on the Summit (see more HERE). As you’d expect from such a classy resort the facilities for children are impressive. Some of the most glamorous hotels have equally glamorous private kids clubs and the Children’s Village at Courchevel 1850, the largest kids ski area in France, has a medieval theme with castles and dragons and even organises magical torch light evening processions for kids. There is fun for adults too; the new toboggan racing track at Courchevel Moriond, with eight tunnels and 40 metres of vertical drop it has all of us whooping for joy. On our last day we ski past the Altiport where those private planes fly in and reflect that only in Courchevel could there be an on-slope airport where celebrities could if they wanted to step out of their planes and onto the piste.